In 2018, I’ve been inspired by people I’ve encountered taking action against war and militarism for the first time. This includes working class teenagers resisting army recruitment, pensioners taking direct action against the arms trade and LGBTQ activists challenging military attempts to co-opt Pride marches. An overlooked phenomenon in 2018 has been the growth of pacifist and anti-militarist campaigns at local and community level. The biggest peace movement success in the UK this year was in Glasgow. The Glasgow arms fair was met by protests that nonviolently disrupted the event. After initially defending the arms fair , the City Council ended up by promising that they would not allow it to take place in Glasgow again. Another success was in Leicester, where local people have campaigned about army recruitment stands in which children as young as seven have been invited to handle real guns. Earlier this year, the Mayor of Leicester accepted that the armed forces should not be allowed to let anyone under 16 to handle weapons. Some successes are partial and many campaigns are ongoing. Campaigners in Cardiff resisted the Cardiff arms fair so well that the organisers have relocated to Birmingham. Now activists in Birmingham want to defeat the arms fair in their own city. In June, Armed Forces Day events were met with protests in more places than at any time since the Day was introduced in 2009. Girlguiding UK triggered major resistance from Guides and Guide leaders when they announced a new partnership with the army. LGBTQ people have held “No Pride in War” protests as armed forces and arms companies seek to pinkwash their image by claiming to be pro-equality. But let’s not flatter ourselves: we have so much more to do. In April, Theresa May sent troops to bomb Syria without parliamentary approval. Brexit makes it easier for the French and German governments to progress plans for some sort of EU army. Vladimir Putin justifies his own vile militarism as a defence against NATO aggression – while the governments of NATO countries and Ukraine simply offer the same justification in reverse. In Britain, ministers stick stubbornly to selling weapons to Saudi Arabia in the face of ever-growing resistance and well-planned challenges from the Campaign Against Arms Trade. Saudi pilots are being trained by the Royal Air Force in North Wales. A trial of army instructors accused of abusing teenage recruits collapsed in March because the Military Police had messed up the investigation, not regarding it as a priority. In December, the news that 3,500 troops are on standby to deal with a no-deal Brexit was revealed in a two-sentence statement by “Defence” Secretary Gavin Williamson. He is gung-ho for militarism, promoting “military schools” and yet more funding for cadet forces while other youth services are cut. His Labour shadow, Nia Griffith, shares his support for Trident, NATO and increased military spending, though thankfully opposes Saudi arms deals. But the growing nationalism and militarism of recent years have faced a backlash. 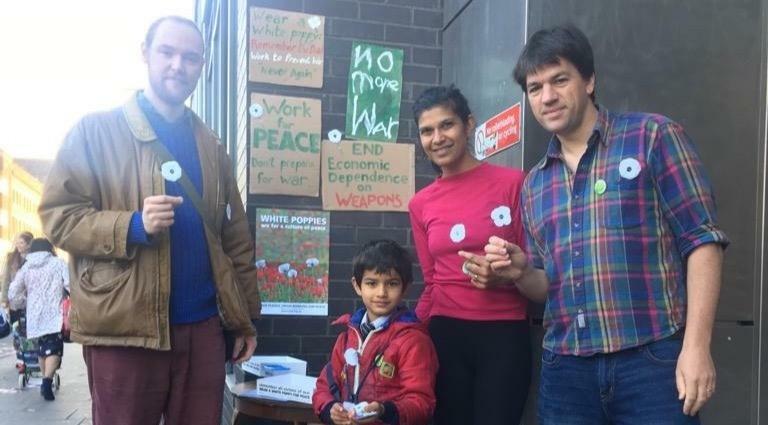 This year, as the world marked the centenary of the end of World War One, the Peace Pledge Union sold more white poppies than have been sold at any time since they were introduced in 1933. The British Legion state that red poppies represent remembrance for British and allied armed forces personnel. White poppies represent remembrance for all victims of war, a commitment to peace and a rejection of militarism. Many people wearing a white poppy for the first time told us they did so out of a desire to remember people of all nationalities. Another reason for the high sales was organisational: my colleagues who organise the distribution of white poppies put efficient systems in place while hundreds of volunteers, in local communities and the PPU office, worked hard to get the white poppies out. This is a reminder that pacifists and other peace activists must think about strategy and tactics as well as aims and values. In 2019, we need to ensure that local, national and international peace campaigns are connected and that we learn from each other. We also need to be much better at linking peace campaigns with other political, economic and environmental concerns. Militarism is a class issue, with the army targeting the poorest and most disadvantaged young people for recruitment. Poverty and militarism feed off each other. Peace campaigns must be a clear and strong component of resistance to economic injustice. Signs of resistance to militarism have been growing in communities around the UK in 2018, some stronger than others. There are some who will say that such signs are not visible at all. Our challenge for 2019 is to make sure that the reality of such resistance can no longer be denied.